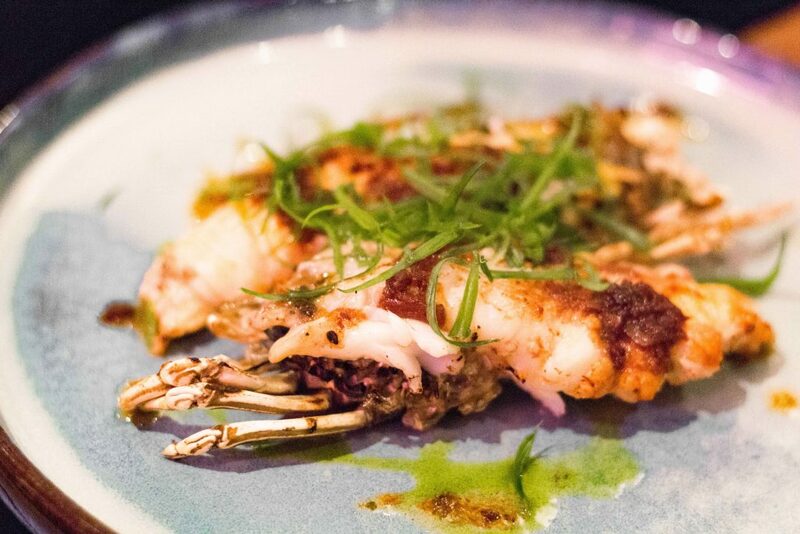 Salted & Hung is known for its contemporary Australian cuisine – that is pretty much unrivalled – and there is no denying that. The allure of it all boils down to its simple yet strong flavours. Executive Chef Drew Nocente simply nails it as he presents his culinary creations in an uncomplicated manner while offering up a medley of robust flavours. 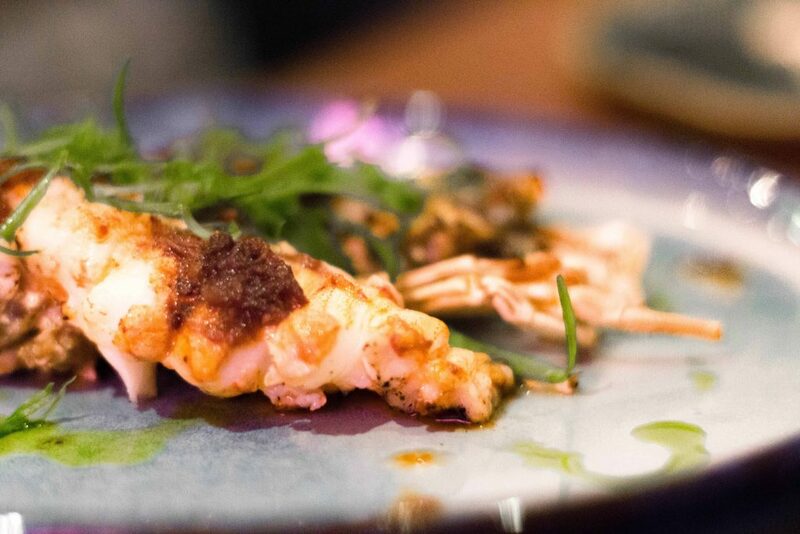 Crayfish served alongside homemade XO sauce and scallions. For one night only on 9 April 2018, the eclectic restaurant served up a specially curated World Gourmet Summit Special Edition menu. Most items on the menu were cooked over binchōtan and apple-wood coals, bringing out the best natural flavours of a produce while dialling up the taste with light smoky caramelisation and fruity after-taste. Here are some of our top picks for the night. Wagyu Tri Tip served with Kale & Cauliflower Puree. Beef lovers would be waxing lyrical about this Wagyu Tri Tip in no time. As Salted & Hung revisited the age-old technique of smoking ingredients with an open flame, we had a taste of the full-bodied nutty flavour that it brought to the sapid and juicy cut of wagyu. The charred surface of the wagyu provided a different texture, giving the wagyu dish a multi-faceted taste. 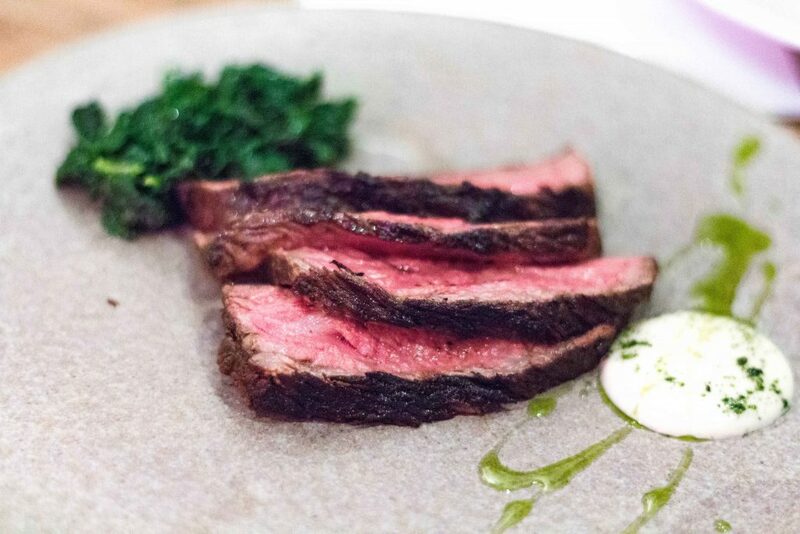 We couldn’t help but to also gush over how well-complemented the wagyu was, by the light and slightly sweet taste of the cauliflower puree and savoury crunch from the kale. 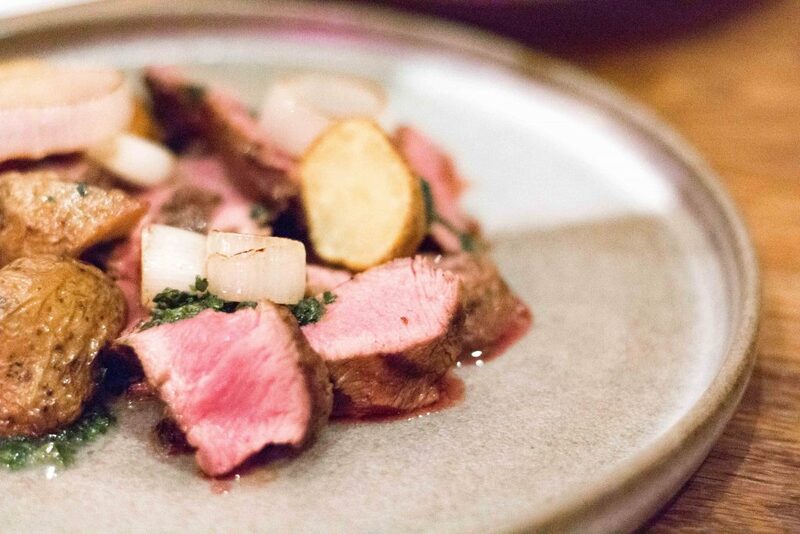 Rose Veal served with Beef Fat Potatoes, Charred Shallots & Salsa Verde. The same can be said for Rose Veal, which enticed us with its succulent and juicy cuts of veals infused with subtle touches of the smoky flavour into the entire dish. These cuts of veals offered a bit more bite and chew than usual but we weren’t complaining as the smoky essence enhanced the taste of the already drool-worthy meat. While these exquisite creations crafted by the chef might appear to be simple, the thought process behind it is completely the opposite. 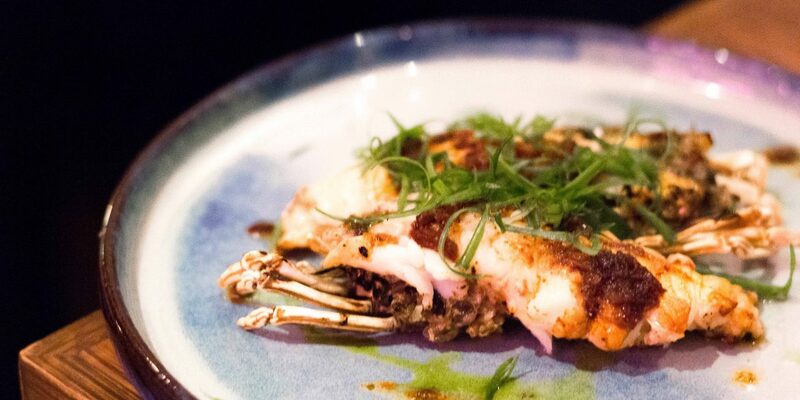 We could certainly taste his careful deliberation on the ingredients to use, simply because the use of house-made XO sauce and scallions with the umami-tasting crayfish was such a match made in heaven. The disparate flavours were also married in a harmonious unison of savoury flavours that did not overwhelm our palate. The crayfish was not dry in the least bit; in fact it was juicy and easily our favourite dish for the night. 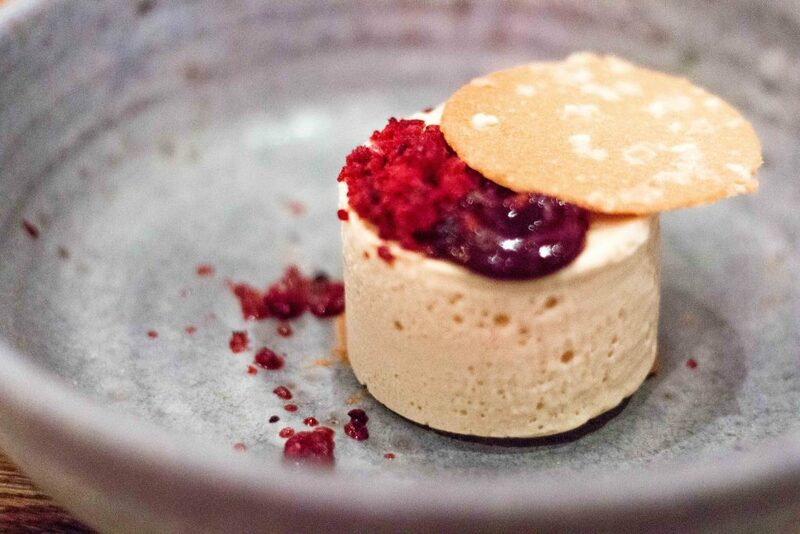 Peanut Butter Parfait served with Sherry Crumbs & Almond Tuile. As with every stellar gourmet dinner, it has to end off on a sweet note – particularly one that leaves a indelible impression on you. This Peanut Butter Parfait sure did while it evoked a keen sense of familiarity with the pairing of the almond tuile biscuit and peanut butter parfait. What won our hearts with this dessert is its striking resemblance to the taste of traditional Peanut Pancakes that we grew up with. It definitely intrigued us with such a nostalgic and not forgetting, tasty flavour. Well, Executive Chef Drew Nocente‘s creativity surely takes many forms – just take his expertly crafted dessert for an example. His World Gourmet Summit Special Edition menu is truly in line with the running theme for this year – discovery. If anything, we are truly sold with the art of cooking with coals and are certainly embracing it with an open heart, mind and a really open appetite. NextWhat is twice better than the HP Sprocket Pocket Printer? A HP Sprocket 2-in-1!